Dive in or dip a toe? Cold water swimming or ‘ice swimming’ is becoming increasingly popular. As the name suggests, it involves swimming in very cold water, usually less than five degrees Celsius. Its proponents laud its fascinating health benefits – there is evidence that it is anti-inflammatory, improves post-operative pain and develops the body’s ability to cope under stress. Swimmers say the huge rush of endorphins brings them back for more, eager to maximise on the health benefits. But new swimmers beware. Even a healthy and fit body does not always react well to jumping head first into freezing water, with no prior experience or period of acclimatisation. Here lies the parallel with the world of investment; the inexperienced investor, ready to plunge into the investment markets. Should they dive in, investing all of their money at once to maximise potential returns? Or should they ‘dip a toe’ and phase their investments over a longer period of time, attempting to avoid a ‘market shock’? Let’s put emotions to one side. The numbers tell us that it makes sense to be fully invested immediately. The benefit of investing in the markets is that on average the returns are higher than remaining in cash (otherwise we would never invest). If the average daily return is positive in the long term, more days invested means greater investment returns. This assertion is supported by the historical performance of our own strategies. Take for instance our balanced strategy. We looked at every twelve month period since inception. Investing fully delivered a better return 72% of the time when compared to phasing over six consecutive monthly tranches. This rises to 76% when compared to phasing over the whole twelve months. But average is just that and not everyone will have the same experience. 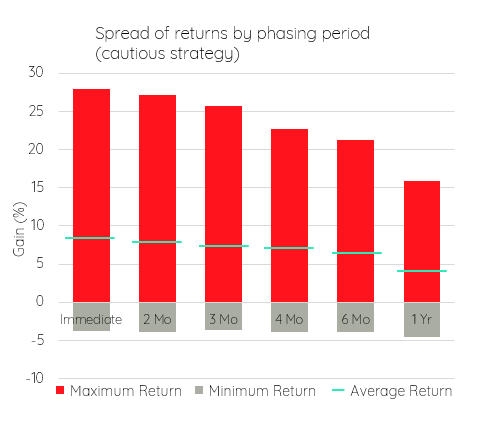 So what would phasing have done to the range of returns over the first twelve months? Phasing entails holding more of your investment as cash, for longer. Cash typically exhibits lower returns and lower volatility. Logically then the range of returns will be narrower as you increase the period of time over which you hold a greater proportion in cash. That is exactly what we see when we look at the historical performance of our adventurous strategy (see below). Historically, investing immediately led to a maximum return of +52% and a minimum return of -31% in the first year of investment, a range of 83%. Phasing the same investment over twelve monthly tranches would have narrowed that range to 51%, with a maximum return of +26% and a minimum return of -25%. The range of returns would have been narrower when phasing. Interestingly the potential gains given up by holding cash were greater than the potential losses it avoided. This is because there are more months with positive returns than months with losses. So phasing is more likely to reduce a gain than a loss. What is perhaps more surprising is the effect that phasing would have had when investing in our cautious strategy (see below). 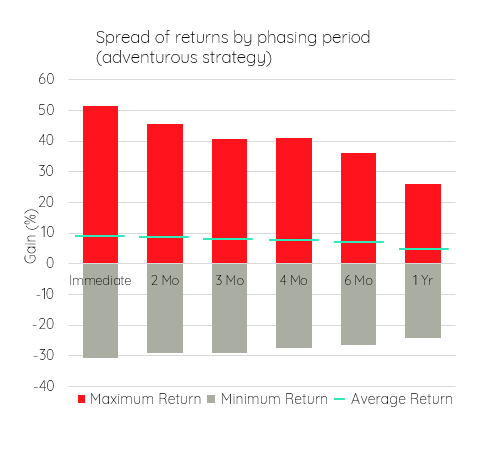 Again, the average return and the range of returns reduces as phasing period is extended. However, in this case, the minimum return is worse (-4.6%) when phasing over twelve months than it is when investing immediately (-3.7%). This is because the cautious strategy has fewer months of poor performance than riskier strategies and it’s also less likely to have periods of consistently poor performance. Phasing, therefore, is far more likely to reduce the positive growth for the cautious strategy than higher risk strategies and is less likely to have the desired effect on the losses. Put simply, phasing only produces a better result when markets perform poorly. Unfortunately, the largest losses in the markets happen over relatively short periods of time, making them very difficult to predict. The evidence would indicate that, on average, phasing your investments is more likely to mean missing out on gains than avoiding losses. However cognitive psychology has shown that we all suffer from loss aversion; we feel losses more strongly than we feel gains. The regret felt by new investors when incurring losses early on is usually greater than that felt when missing out on gains. Maybe the best parallel between investing and ice swimming is the level of ‘acclimatisation’ required to maximise the benefits. If you are investing in a relatively cautious portfolio or if you are accustomed to investing in volatile investments, then you may not need much acclimatisation. There is little to be gained from phasing your investments. You may as well ‘dive in’. However, if you are new to investing and are embarking on a more adventurous investment plan, you may want to start by ‘dipping a toe’. The ‘Insight’ piece charts are for illustrative purposes only. The charts represent the spread of returns over any period of 12 consecutive months between April 2007 and September 2018 for Edison’s adventurous and cautious strategies. Edison Wealth Management Limited is authorised and regulated by the Financial Conduct Authority. The company is registered in England and Wales and its registered address is shown above. The company’s registration number is 06198377 and its VAT registration number is 909 8003 22. All the performance data used in this report has been sourced from Morningstar.